I wrote this in 2016 and finally decided to publish it on this blog. It was my first written foray into the mechanics of deep space industrialization. "I am Sita." She could write a monologue of thoughts, organized by each activity at the moment of ideation. Identity and thresholds seemed to go together. She ran the flow check necessary to use the Mars surface airlock safely. Open valves to dump lock atmosphere into the air processor. Close valves. Check pressure on both gauges. Check the spacesuit was, in fact, not pajamas. Well sealed. Comms, temperatures, smell, pressure holding. Ears didn't pop--always a good sign. She reached for the external door locking wheel and put her weight behind the mechanism. It ran smoothly enough. With practiced motion the door unlocked, opened inwards. A tiny puff of dust, cut by slanting rays of faded sun. She stepped through the narrow portal, like a submarine bulkhead door. Like a birth canal, no wider than it had to be, at least for people. Their machines birthed through a different door. Vivid memories of her former life on submarines surfaced and just as suddenly faded into the depths. Between this outpost and those underwater islands of humanity, there was something fundamentally insular about society. Sita was here, now. She stretched towards the open sky for now there was no roof over her head. A few light steps over the trampled ground and, with intake of breath, a staring at, an acknowledgment of the horizon. If a problem is spherical, it is hard to see all of it at once. Sita's problem was Mars. The outpost behind her looked no more worn than it actually was. Sita had accepted the mission with eagerness. Go to Mars, live there until something breaks beyond repair, then bail out. If you could. Sita had not flown with the exploration missions. She had waited on Earth and then flown with the outpost. She herself had explained it many times. "How do you solve the problem of machines eventually breaking more frequently than they can be fixed?" On Earth, all machines would eventually be retired, but on Mars, the very air was produced by a machine. Therefore, an outpost on a dusty plain where humans lived indefinitely, with resupplies of parts and sometimes crew, every other year. Sita and a few others lived in this experiment. Or the experiment lived in them, since the blood and toil that kept the concern operational was the sheer dexterity of human ingenuity, their own capacity for biological regeneration, far better than any machine, and occasionally a liberal dose of the will to not-die-that-day. And, she mused, a gigantic nuclear reactor. Every machine, every light, every pump, every vehicle, every robot--they all needed power, and their nuclear reactors provided it. She could see a heat shimmer beyond a nearby hill where they operated and quietly irradiated the surrounding area. Heaven help them if it ever broke down! She scuffed the ground. How many years ago had they trenched the ground here, laid the power cables deep enough that frost creep and spring blow and wheels couldn't damage them? That tractor had been trouble from the start. Like every other machine, they could and did completely disassemble it with basic tools they had in their inflatable workshop. But, like nearly everything else they had back then, it had broken too frequently to be worth repairing. Sita had dragged it out to the boneyard of orphaned machinery, a place of sculptures, metaphorical monuments to industrial ambition and too much clever complexity. There, with dozens of other unloved machines left by parents too busy to keep them alive, they waited only for oblivion. Which was worse? Gradually harvested for scrap, whittled away to nothing, and yet pieces living on as parts of other, more valued equipment? Or forever neglected, until sun and sand and aeons abraded the paint, wore away the shell, the chassis, and scattered every molecule in a wide, flat, glittery sand dune that ever so gradually slunk downwind from the outpost in shame? Of course, Sita reflected, being recycled in some sense only delayed the inevitable for obsolete machinery. And indeed, explorers had passed, their bodies unretrieved, sometimes. Caught out at night, perhaps, and frozen to death. Or fallen and breached their suit. Or broken bones. Or poisoned by bad air. Or burned. So many abrupt paths to the end. Sita had found one once. Kind eyes in his frozen, perfectly preserved face stared up through his wind abraded helmet, right into the void. Right into Sita's own black eyes. His peaceful expression reflected none of the ambition that must have driven him to Mars, to die out here alone. Her suit's profile, a hemispherical head with burning flashlight eyes, reflected in the glass of the deceased. The yet living and the dead superimposed in imago, like one hand covering the other. They placed him in the burial ground, opposite the boneyard and obscured beneath the crumbled surface. Sita never found the other bodies. In her mind, they gradually transmuted from cogito ergo sum insularity to landscape. Wouldn't they all eventually find themselves blasted to smithereens by the passage of time, condemned to wander the northern latitudes by seasonal winds? Perhaps, given the risk of explosive decompression, that was why thoughts of identity and more importantly its willful continuation pervaded during airlock operation. Sita's mind and eyes wandered the landscape as she stared into the horizon. Their outpost was spread out over a large area, a perfect island of solitude within a world that was, for now at least, empty. Positioned in a broad valley between distant ranges, their faded peaks in the distance. A tiny speck, a blemish, precarious in a nonsense landscape that told a garbled saga of dust and ice and wind and countless ancient impacts. Her booted heel scratched at the ground as she turned to take in the view. She felt the sun's weak warmth through her pressurized carapace, her inner reptile took a second breath. In the distance, beyond the greenhouse, beyond the burial ground, she spied their return vehicle. The rocket sat there, inert, waiting to take them back to Earth. It had waited a decade. Four times, Earth had swung across the sky, daring them to cease their foolishness and fly home. Four times, they had duly performed the procedures to wake the sleeping behemoth and prepare it, just in case. Four times, Earth had passed out of range, its pale blue dot fading amongst the rest of the stars, and their loyal rocket had been put back to sleep. Sita wondered if the rocket could tell that Earth was no longer really home. That morning, something had changed. Everything had changed. Sita felt she could have been happier. Against the odds, that same morning her mission had been deemed successful, by the squints up on the big world. Her team had proven the design methodology that could keep them alive indefinitely. Now, humans could come. Humans would come. First by the dozens, then the hundreds, then the thousands. An unstoppable rain of humanity from the sky. And her maintenance protocols would keep them alive, most of them, while they built their mines and refineries and foundries and factories and farms and cities, until humans could live on Mars without continuous resupply voyages from Earth. Industrial autarky. Involuntary industrial autarky, necessitated by the hundred million miles of space between the nearest money and her. At least until someone made a warp drive or something. Then people would come by the million. Sita felt numb at the prospect. For a decade, just her and a handful of others under the Martian sky. Long rover traverses, endless testing, breaking, and repairing. Blue dawns to red days to blue dusks to black nights. Nothing but a planet and a mind, her mind, in it. Building Field Camp 18 in the next valley, confirming the aquifer. Building out a farm, growing food. A lifetime of learning and building and fixing and learning all over again. They had one hundred days left. A message from the pale blue dot, confirming launch after thundering launch sending cargo and passengers to Mars. One hundred more days of relative solitude, before the new Martian hordes landed at the field camp aquifer, unfurled a gigantic tent over the barren plain and made the frozen desert bloom. There would be so many new faces. What does a face even look like? From the outside? Sita didn't have to wait around to find out. There were still tasks to complete, systems to check, failures to diagnose, procedures to document. And Sita still had one hundred days of solitude to tread the rocks beneath her feet. Some were dark, scattered, their faces faceted and scored by wind. Some were rounded, perhaps some ancient alluvial disaggregate. And beneath them all, more rocks. Rocks on rocks, all the way down, enough rocks to hold a person to the planet's surface with a gentle, forgiving force. Sita could jump right over a rover in the three-eighths gravity. Not such a good idea, she thought as she eyed the dozens of patches holding her pressure suit together. It would be thought exceptionally bad form to leave the ranks of the living just before things got really interesting. Sita stared beyond the return vehicle, right out along the almost featureless plain until the horizon's pastel browns and reds smeared ground right into sky. The horizon on this tiny world was never that far away. She could walk over it before lunch, find the outpost completely out of view. She could even make it back without running out of air, probably. Her helmet's glass fogged slightly with each breath. It was never warm outside. She checked her gas and power levels, then sat down on what had once been a voice command mainframe interface, its little silicon brain zapped by a cosmic ray. It had been a slow death, rambling ceaselessly in idiomatic Esperanto while Sita attempted repair before it, too, succumbed. Now it was a bench outside the airlock. Sita leaned back and looked up towards the zenith, where the sky is always white. Why does the universe contain introspection? Why so little? Why at all? Her eyes looked through a few inches of air, a millimeter of polycarbonate visor, the pitifully thin Martian atmosphere, and then infinite space, where the very first photons were stretched beyond the limits of human eyes. If you look far enough in any direction the view is deepest red. Metal robot oblivion dust is probably more glittery than the scoured remains of dead Martian explorers. Sita wondered how glittery she'd end up. If she lived long enough for the new city to get its biosphere up and running she'd request they recycle her remains. Nitrogenase and tyrosine are hard enough to come by without dumping them onto the frozen, ultraviolet blasted surface. But how was being eaten by worms any different from her recycling parts of broken machines? Were not humans machines themselves? Thinking, feeling, self-repairing and optionally self-replicating machines, but machines nonetheless? Sita could cut off her oxygen supply with trivial ease. She could purge her suit's fuel right into the dirt. There would always be new ways to die a pointless death on Mars. But nothing could stop the new ships bringing new people to their new world. Sita's mission had shown that humans could live on more than one planet. Her identity was now part of the tapestry of human destiny. Something to mull over. Sita stared at the sky and remembered the site as it was before they had built the outpost. She liked its design, a central hab connected to a variety of satellite structures by cylindrical tunnels. Against the odds, a tiny patch of human-habitable volume in an unlikely corner of the universe. Her project, her refuge, her home, her triumph. As much as she empathized with her ragtag family of machines, only flesh and blood could rebraid itself into humanity's raging torrent. More than her physical constituents would survive her passing. The contribution of her life's labor to the pool of human achievement might even someday enable her to find meaning despite the inevitability of both death and self pity. Sita once more looked into the distance, where together they would all build their new city. In her mind's eye she saw their arrival on Mars. They would come, just as the previous cargo resupply missions had come. One by one the ships streaked across the sky. They came as a bright dot, then an expanding fireball, each brighter than the sun. Then the crack and jolt of the sonic boom, the roar of engines felt through her feet. The sun careened off the panels of each ship as they hovered, descending suspended on point-like engine glows and fat columns of dark, rushing smoke. And when the last of the ships had landed, their engines cooling but their effervescent contents not yet disgorged, Sita alone would savor that final moment of silence. This post is the first in a series describing a number of recent projects that I've recently completed! This one is to do with rockets. Some time in 2015 I was reading some space exploration history and came across this photo on Wikipedia. It depicts the Redstone and Atlas rockets launched with humans on board as part of Project Mercury - the first six flights to space by US astronauts - at their moment of lift off. At this moment, the rocket is supported entirely by hot expanding gases at its base and is pushing hard to escape the Earth. Of course no crewed flight has ever completely escaped Earth's gravity (yet) but getting to orbit is just staggeringly difficult and amazing. Here's another photo in a similar vein. 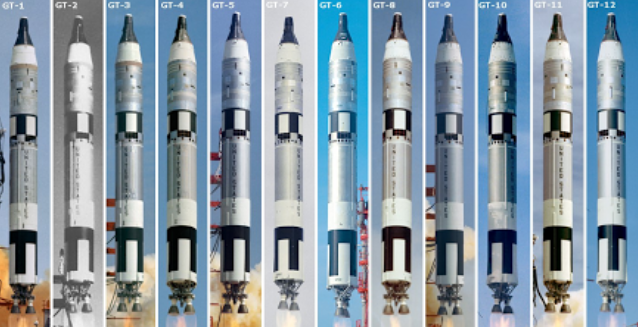 These are the launches in Project Gemini, ten crewed launches by Titan II to Low Earth Orbit to test technologies for the Moon landing. 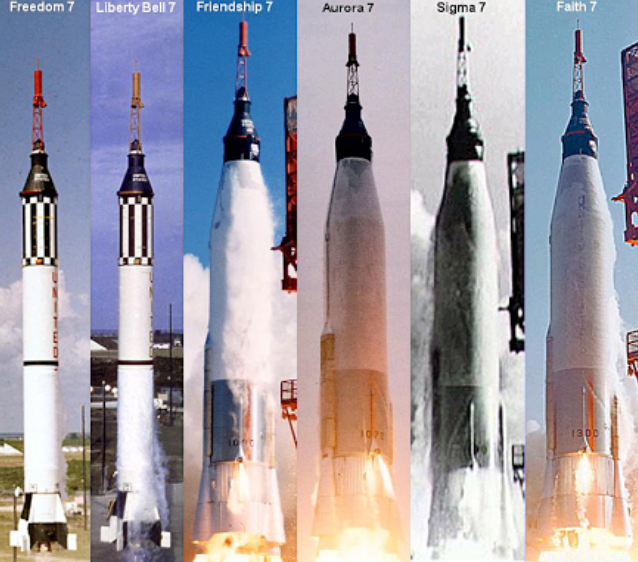 Each flight tested a variety of things, such as space walks, docking, control, orbital rendezvous, and the systems that made them possible. 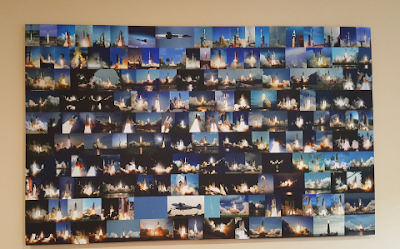 The following Apollo program used two types of rocket, the Saturn IB and Saturn V. The Saturn V was the most powerful rocket ever launched, and here's a photo of every flight. The first two flights, and the last flight, didn't have people on board. But Apollo 8-17 took three humans each into space. Six of these flights (11, 12, 14, 15, 16, 17) landed two people on the moon, a total of twelve humans who have ever walked on another rock. As of February 2018, seven of these have died of old age, leaving just five alive. 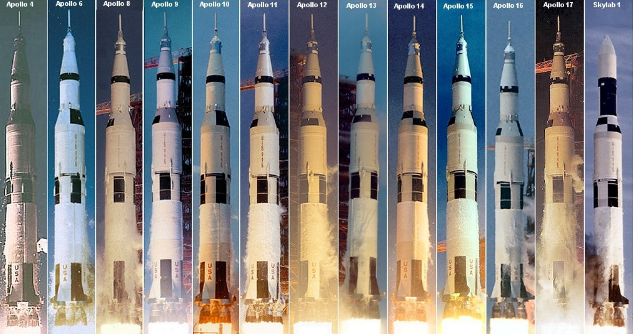 Given the time it takes to develop space exploration programs, there's a good chance that even if China, Russia, the US, or any other country began development in earnest tomorrow, all twelve Apollo moon walkers would be gone before anyone else landed there. Food for thought. 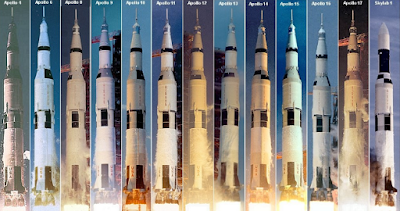 After Skylab was launched on the last Saturn V flight, the three remaining vehicles were parked in various museums or fields and the US space program turned to the space shuttle. 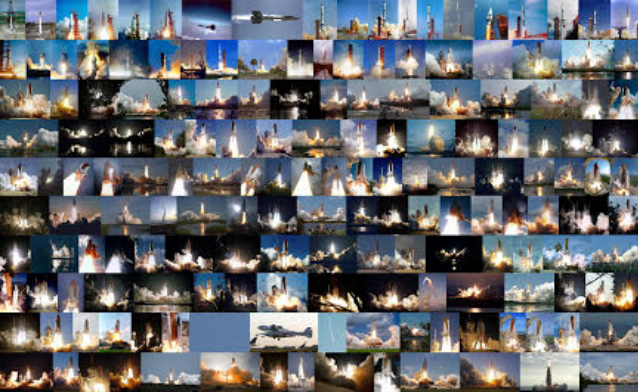 Over about 30 years, the five shuttles launched nearly 800 people into space on 134 separate successful launches. One more launch was not successful, and one re-entry was also not successful. The shuttle was retired in 2011, and since then no astronauts have launched to space from US soil. Hopefully this won't be a permanent state of affairs. 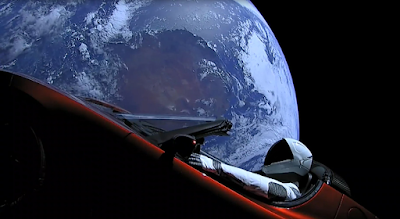 Several entities, including NASA, Boeing, SpaceX, Blue Origin, and Virgin Galactic are developing human rated space vehicles which are due to fly in the next few years. Still, I was captivated by the minuscule number of rocket launches that have *ever* launched people to space, so I decided to make a version of the images above that included every single launch. This process began with identifying every launch and a photo online and collating them in a gigantic spreadsheet. While I was at it I wanted to collect metadata - the who, when, where, why, and how, and combine this somehow. And since I was being ambitious, I have a separate spreadsheet for Soviet/Russian and Chinese launches of humans into space. In total, a meager 321 flights to date. Fact checking and proof reading all the metadata took FOREVER. 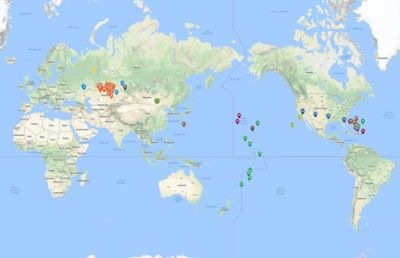 But one really cool side effect was being able to make a world map with all the landing sites, colour-coded by program. This is what the metadata formatting looks like in the final version. If you find any errors, be sure to let me know! 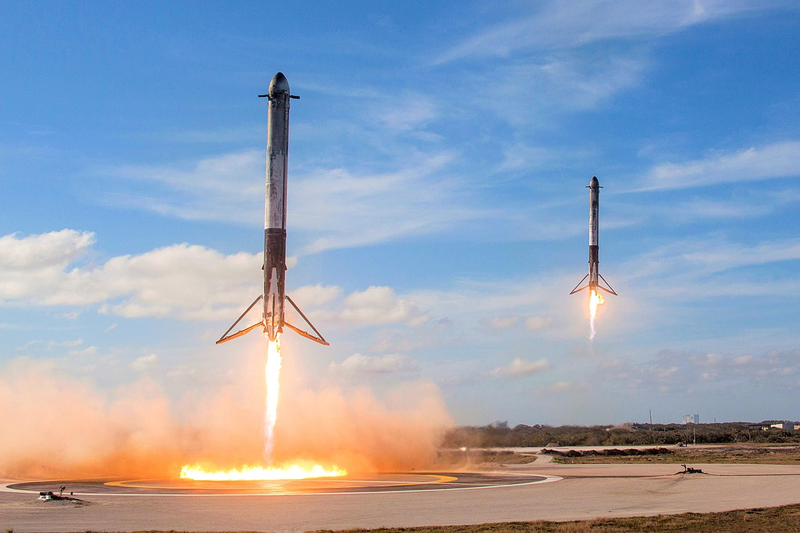 I quickly realized that photos at the moment of launch and the same perspective, while being in some cases difficult to find, are also very similar and thus monotonous. So I found a variety of photos of launch that captured some of the power and diversity of the experience. In 2011 I personally witnessed the last launch of the space shuttle in Florida, and it is really something else, even from 10 miles away. After two years of neglect and then a few months of work, I'm pleased to report that the US launch poster is complete, and indeed hanging on the wall behind me! Moreover the metadata poster is also done. The full size images are available on my website, but this is what they look like! And the version with all the metadata. 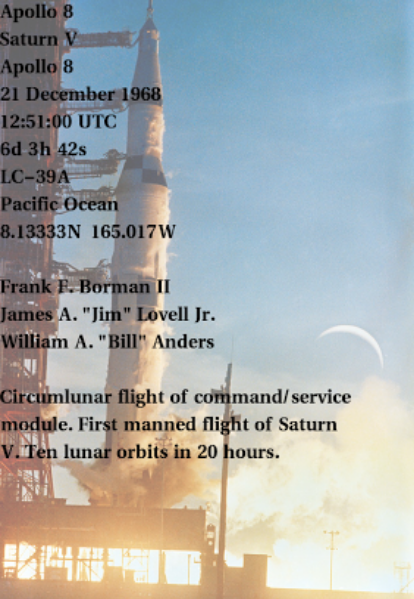 As an important note, Challenger's final flight is not included in this list as it did not make it above 100km, the boundary of space, before catastrophe struck. By this criteria, other failed missions including Columbia's last flight, Soyuz 1, Soyuz 11 are included as they reached space before suffering fatal accidents during landing. Finally, Soyuz 18a, which suffered a staging fault but reached an apogee of 192km before (barely non fatally) crashing to Earth, would also be included. Early X-15 flights which went above 50 miles (80km) but not 100km, are excluded. I would love to make a Russian version or even a combined version, but unfortunately publicly available photos of Russian launches are often of very poor quality, or even missing entirely. If anyone can find me a photo of Vostok 3, Vostok 5, Soyuz 12, Soyuz 18a, Soyuz 22, Soyuz 23, Soyuz 34, or Soyuz T-14, that would be amazing. Russia is still regularly flying people to space, so the poster would probably have to have a few blank spaces towards the end! In the meantime, I literally cannot wait for a new US human space launch so I have to update and fix the poster. I'm glad to have finished it off and I hope you enjoy looking at it as much as I enjoyed making it.